Looks awesome. How much does it weigh? only 10 lbs but i got 5 more i can add in i just want to keep the vest slim so i can do all my regular workouts with it. Times are really tough in the UK, massive recession and not much work/jobs or money to fly around no more. The government has gone way to far with all the cutbacks. That means we have hardly any workout parks throughout the UK. There are a few situated in London, but that would mean I have to get a 40 minute train to the closest one. I use chairs for dips but those bins probably work perfectly fine! 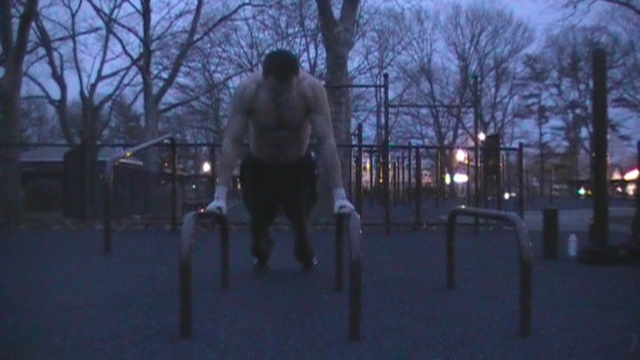 I'm still so new to it that dips ruin me, so I'm working negatives on those at the moment. 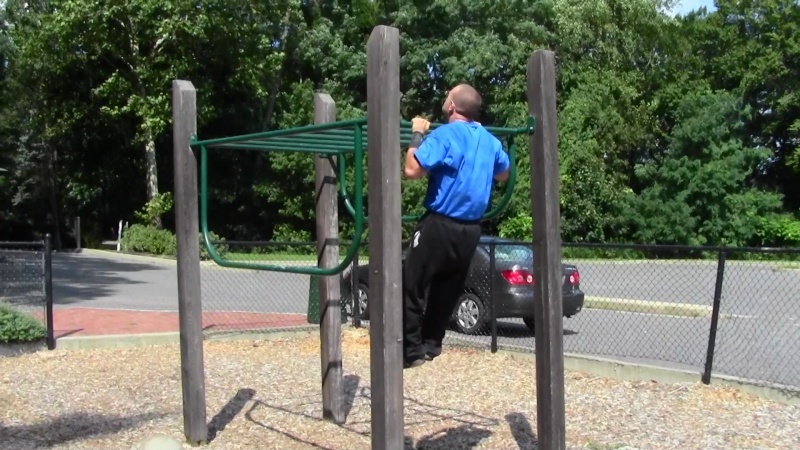 Doing the same routine for those that I do with negative pull ups, coming on really nicely. The bins do work well, although they're a little low so you have to bend your legs at the bottom. Although I've started messing with routines already. I can't do an L-Sit yet but am working up to it, so I go into a knee raise and hold it for the full ROM of my dip negative. By the time my feet hit the floor it's near perfect full ROM so works out nicely. It'll seem piss easy to pretty much everyone else on here, but works for me. 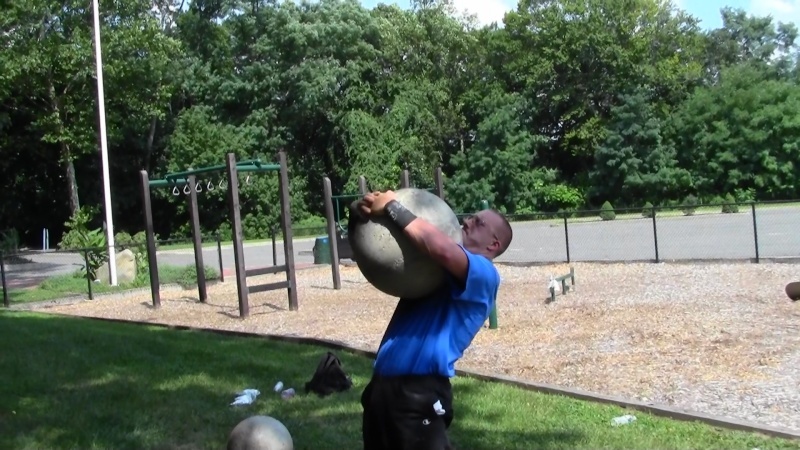 Atlas Stone + Calisthenics. Part of my new training to increase total power. What is that, a 200 lb stone? That kicks a$$! Did you make it yourself? I've seen some great tutorials on YT using kids bouncers and plaster of paris to make a mold, then filling with concrete, drying and breaking the mold. jimsiff the atlas stone is 175lbs. 17" i found someone who makes them in their garage. I also lifted the 205lbs. stone on my first try. 50$ well worth it. I want a 240-300lbs. stone soon this is just to start. What i do is lift it up and shoulder it slam, then left shoulder slam, 1 toss+ superset it 20 pullups then 20 dips or pushups for 10 sets. minimum. Lifting the stone before those weakens you badly so you have to try much harder for the exercises that are normally simple. Today my traps,shoulders, chest, forearms are sore like never before it taxes everything. Funny now the park has craters all over like the moon. 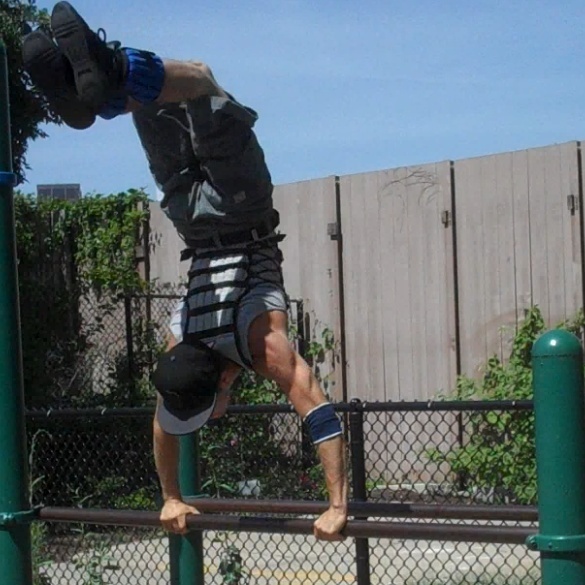 Upping our power/endurance/strength w/ the new heavy stone, L-sit rope climbs, and calisthenics all weighted & just bodyweight my training needed a change these have helped a lot. The stone increased my deadlift from 400lbs. last set 10-12 reps to now 440lbs. 10-12 reps last set. I feel i can perform strong from the beginning all the way till the end of the workouts. Goal is to never be comfortable with where i am at.To always know there is a higher level of fitness that alone keeps me going daily this was my rest day. Lou, that new stone...what?...225? I especially like that rope climbing of yours on that tree. Enigma haha the stones will only get heavier, just got this one at first felt immovable now i am a little comfortable will use this till its a feather. how do you post images here? I click on the image symbol with the disk, select my pic and nothing happens. NGNFitness where it says host image click that then where it says browse you go through your files and pick the picture you want, at bottom copy the link gives.click image and paste it to there. Old pic3yrs. think when i first discovered the park had more hair too, was cold out use to stay till dark when the guards kicked me out. 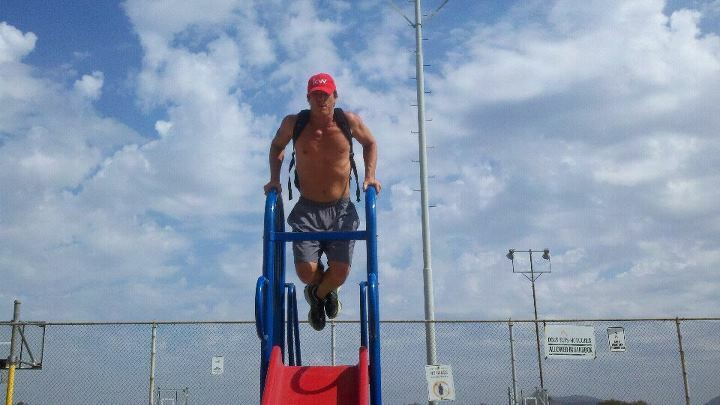 last week at the park where I work out, if Im not workin out at home. I would guess somewhere around 12-13% body fat. Cool, the online calc told me I was 17.5% and I thought I was clo.ser to 10. 13% is a good point to start from. At the park today. At the top of a slide. Nice! I would of said around 11%.